Looking at broken, antique glass bottles a lot can be learned by flipping them upside down and peering into the details of the bottom. In the case of a historic bottle I analyzed for class, a company, but not just any company, a company intent on merging other companies into their own. This aqua coloured, 16cm tall broken at the neck beer bottle had and AB logo on it with the inscription: Y12. When I first looked upon this bottle I assumed it was made in 1912 due to the number but also that, once I had researched was made by the company:The Adolphus Busch Glass Mfg. Co. But when further researching this company I found that it had been picked up by The American Bottle Company in 1905. Located in Newark, Ohio, this company had a tendency to take over other glass companies including the Adolphus Busch but also companies like The Massillon Bottle and Glass Company. 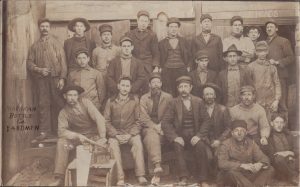 Bellow is a photo of men that would have been apart of the larger American Bottle Company from one of the smaller companies. The bottle itself would have been made either in Ohio or at the original site of the Adolphus Busch company in Missouri. It would have contained some type of beer and was most likely consumed within a home or at the bar in a local pub in Seattle (where it was found). Beyond the basics of what the bottle contained and where it was from, a lot can be learned about the history of its creation by looking deeper into the glass itself to uncover the company that created it. In this case the American Bottle Company. This entry was posted in Glasswares '17, Historical Archaeology Class Blog (Winter '17) by bloomk2. Bookmark the permalink.